Click here to download the app from your app store. Error: Phone number should be 10 numeric digits. Our mobile app is now better than ever. 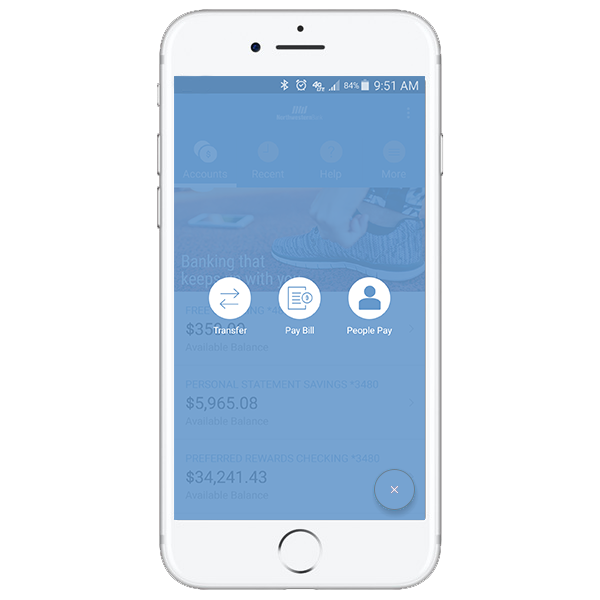 Whether checking your balance, paying a bill or transferring funds, our app delivers a new level of speed, convenience and security. Thumb-based navigation makes it a breeze to perform all functions of the app in seconds. 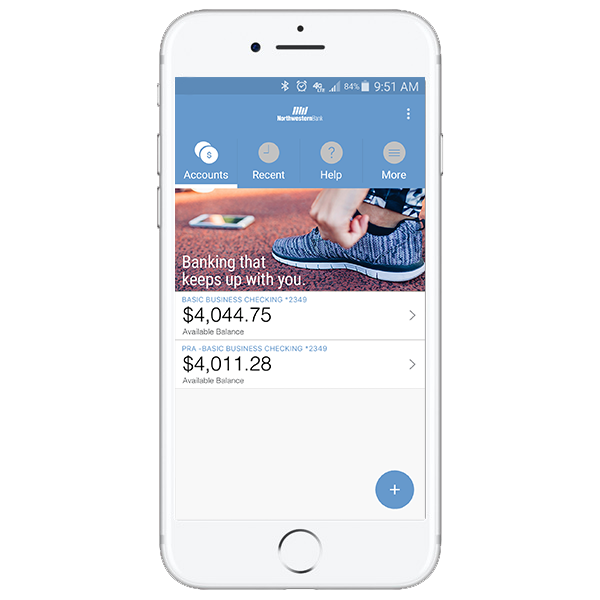 We’ve optimized our app’s performance to ensure your mobile banking tasks are quicker and easier than ever before. Our streamlined look and feel makes navigating the app even easier, allowing you to complete your banking tasks more effortlessly. As fraudsters get smarter, we’ve stepped up our mobile security to keep your accounts safe and provide peace of mind. 1. To sign up for mobile banking, you must first open an account with Northwestern Bank. 2. Once you have an account with NWB, you must enroll in personal online banking. 3. Download the NWB Mobile App to your device and access your account. Mobile Deposit: Tap. Snap. Submit. Now you can deposit a check without making a trip to the bank, thanks to the "Mobile Deposit" feature on the NWB Mobile App. Just sign your check, take a picture of the front and back with your smartphone camera, and press a button to deposit into your account. It's just another convenient reason to try mobile banking with NWB! Click here for step-by-step instructions on how to make a Mobile Deposit. Refer to the Mobile Deposit: Frequently Asked Questions (FAQ) page to find an answer. 1. An eligible account with Northwestern Bank. 2. An online banking login. 3. The NWB Mobile App, downloaded to your device. People Pay: send money to anyone, anywhere, anytime. Are you short on cash, or did you forget your checkbook? Send money to someone instantly using your smartphone. All you need is their email address or phone number. It’s an instant, secure payment — through a financial institution (Northwestern Bank) that you know and trust! 3. Send money. You can send money to almost anyone with an e-mail address or mobile phone number. 4. Receive money. The person receiving the money is sent an email or text notification with instructions on how to claim it. Refer to the People Pay: Frequently Asked Questions (FAQ) page to find an answer. Pay anyone from your checking account , anywhere, at your convenience while saving time, stamps, and stress. Northwestern Bank’s bill pay system makes it easy to pay bills online, whether you submit payments one time or schedule them to occur on a regular basis. With online bill pay, you’ll always have the peace of mind knowing your payment has made it securely to its destination. Northwestern Bank's ebanking offers a whole host of online banking services at your fingertips whenever and wherever you need them. Save time and the planet simultaneously. Need help with Ebanking? Click here.